Winter In Big Sur. It's my favorite time of year to photograph this iconic coastline. Last month I held my 7th Annual Winter in Big Sur Photo Workshop there and once again, this rugged landscape didn't disappoint. The absence of fog this time of year is one of the attractions and it allows for extremely vivid dawn/sunrise and sunset/dusk colors. Moreover, with the low sun angle at this time of year, one can shoot longer at each end of the day without the concern of harsh light. Whenever I lead a workshop, I learn something and I'm also reminded of some of the fundamentals of photography. Here are some tips inspired by my favorite images taken during this year’s workshop. 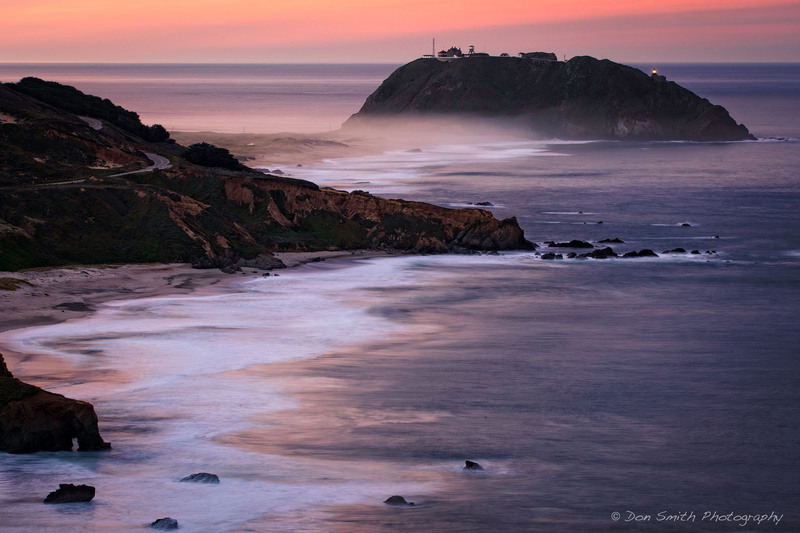 This image was captured at dawn from the headlands looking south towards the Pt. Sur Lightstation. An overlooked lens for landscape is the 70-200mm. For this scene, I wanted to compress the three main elements in my composition: the foreground arch, the middle headland and the Lightstation. I captured this at 150mm with my full-frame Sony α7R II. With an aperture of f/22, I was able to get a starburst off the Lightstation’s Fresnel light. It’s amazing how much visual weight this tiny light holds. The workshop started with an afternoon of heavy swells. 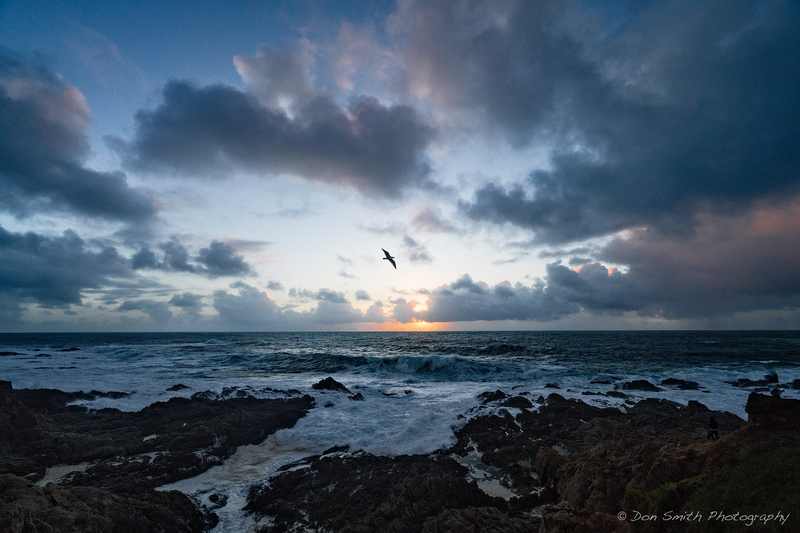 I chose Soberanes Point located on the northern side of Garrapata State Park as this is one of the premiere wave locations along the coast to photograph waves. One of the keys to successful wave photography is to shoot with long glass and a fast shutter speed. 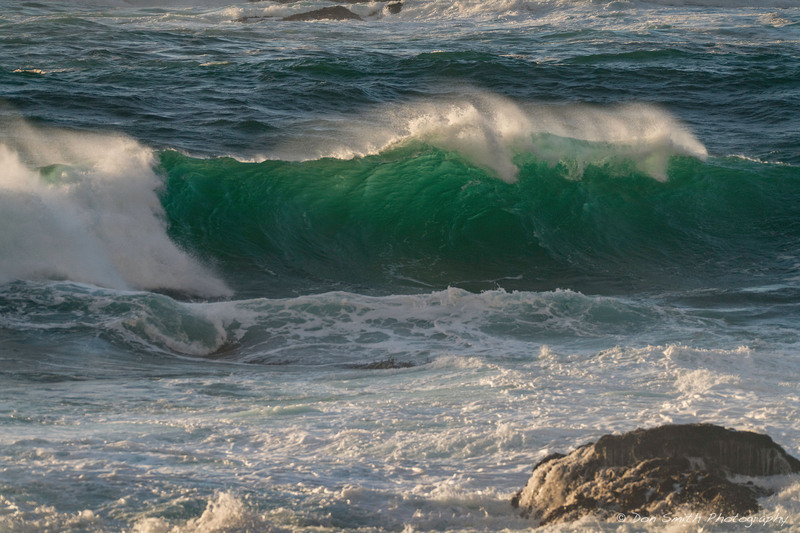 I captured this “turquoise wave” at 300mm and 1/1,000th second shutter. With that speed, I was able to capture the back-spray off the tips of the breaking wave. After the group finished shooting waves, we waited for the sun to set. I caught this seagull out of the corner of my eye and waited until he flew into my frame. I loved that this small bird brought a lot of visual attention to this image. While scouting new locations for the workshop, I decided to checkout Matterhorn Rock. I would have loved to have included this location for the workshop but decided not to due to safety reasons. The high surf we had throughout the workshop made this shelf unsafe – what I call a “trap zone” with no quick escape route for my participants. I made this image during a milder surf day. I got a bit lucky as the setting sun found this opening in the clouds. I used an aperture of f/22 to get the starburst affect. 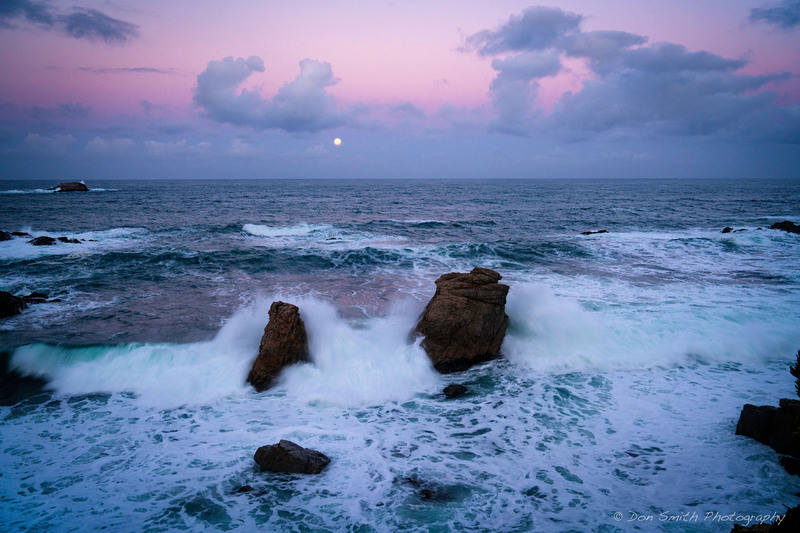 Our first early morning shoot involved photographing a dawn moonset at Soberanes Cove. Each year I base this workshop around the full moon cycle, which allows my group the chance to capture the setting full moon on two consecutive mornings. This moonset afforded a tighter window of opportunity. I wasn’t sure if the clouds were going to obscure the moon, but as the dawn light began to paint the sky a warm pinkish hue, the moon once again became visible. I positioned myself so it was between these two sea stacks and just waited for some waves to crash into the stacks. 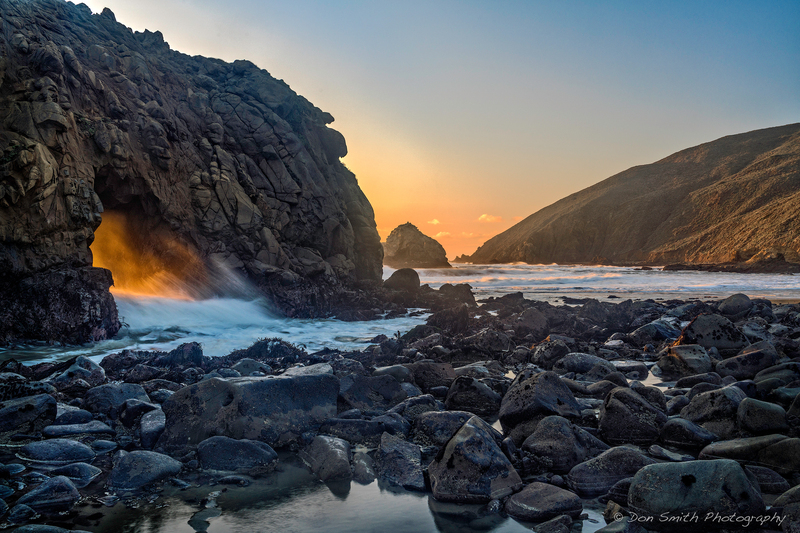 One of my key sunset locations during this workshop is Pfeiffer Beach. At this time of year, the sun lines up with the opening of the arch creating a warm shaft of light through the portal. With all of California’s El Nino rains, there had not been a clear evening for more than a month. When we arrived on the beach, there were over 50 photographers already setup – and we were still 90 minutes away from sunset! Fortunately, everyone got along and we were all able to get our shots. Having photographed this location numerous times over the years, I opted to see how the Sony α7RII’s sensor would handle the extreme contrast in this scene. As you can see, it captured it beautifully. I’m continually blown away by how close this sensor comes to capturing the contrast the way my eye sees it. I took my group to one of Big Sur’s most iconic locations, McWay Fall at Julia Pfeiffer Burns State Park. I never tire of this beautiful place that includes an 80-foot fresh water fall. 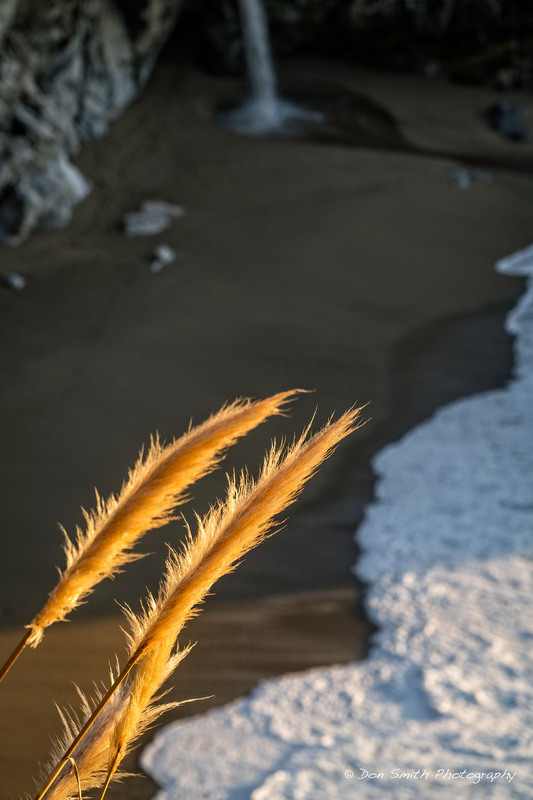 On this evening, I chose to relegate the fall to a secondary element in my scene as the lowering sun painted these otherwise innocuous Jabata grasses with warm light. Once I figured out my composition, it was just a matter of timing the incoming surf line to complete the shot. 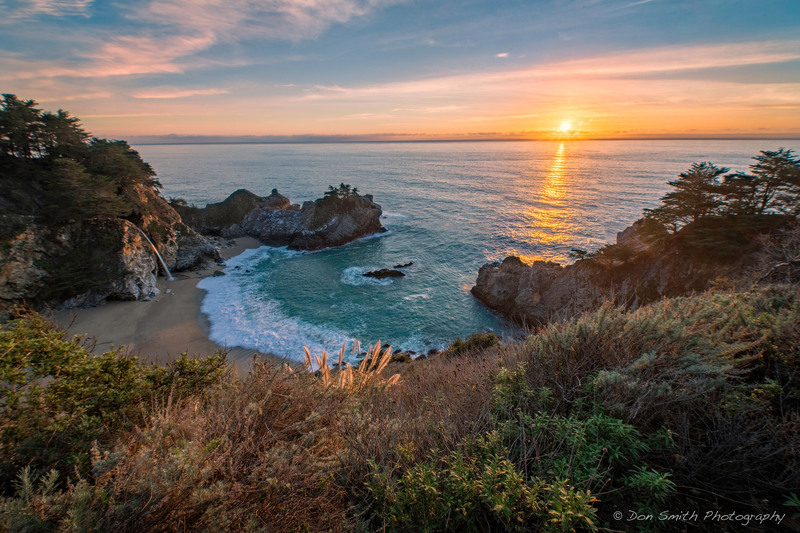 During January, the sun lines up with the opening of McWay Cove making it an ideal spot to get a sunset photograph. For this image, I combined 5 frames bracketing by one stop and I combined them in Lightroom CC 2015 to create this natural looking image. I’m not a fan of HDR and fortunately, 32-bit processing does not create the over-processed or crunchy look of most HDR images. It was key for me to retain the warm look on the Jabata grasses in the foreground and once again, the extreme dynamic range of the α7R II’s sensor was indispensable. The grasses reproduced exactly the way my eye saw them! Most of my workshops include an evening of night photography. 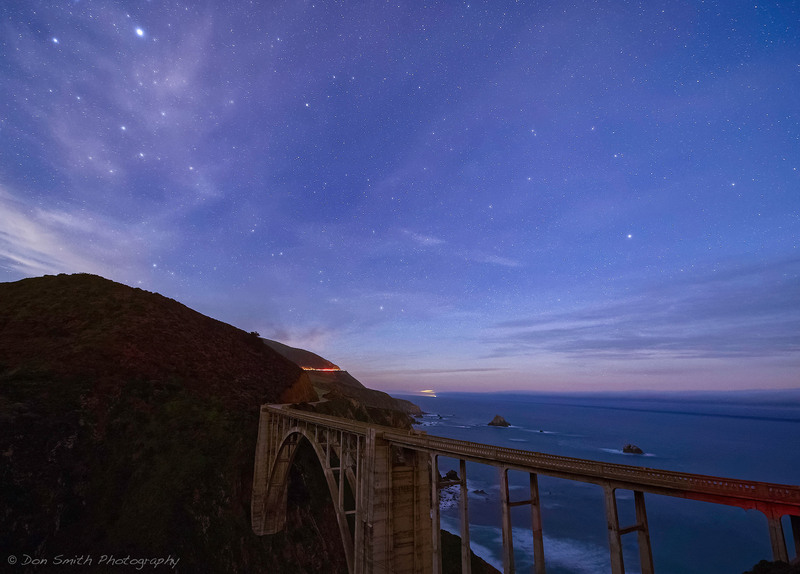 We had clear skies on this particular evening and I took my students to both Hurricane Point and Bixby Bridge. This was one of my last frames of the night shoot. I opted to place the bridge in the foreground and with the Sony α7S, I was able to record the scene with lots of detail and very low noise. I always shoot in RAW, and when shooting high ISO images, I run my file through DxO OpticsPro 10 software with its PRIME RAW noise reduction. With my a7S files, the results are virtually noise free! After the night shoot, we were out just as dawn light started painting the sky with its vivid colors. Our group was actually able to shoot two locations as on this particular morning, the vivid light held. 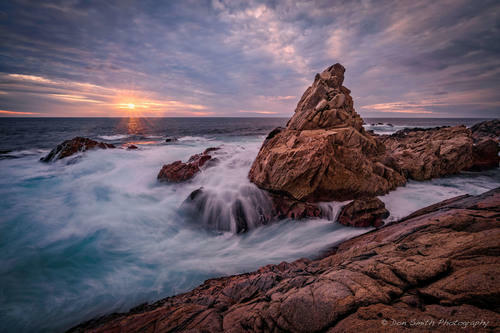 Hurricane Point was our second of the two stops and I handheld my Sony RX100 IV almost ground level to compose this shot. Getting the camera low and using the articulating LCD to compose, I was able to create this image to give prominence to these tiny flowers and allow for an interesting foreground to go with this dramatic coastline. I really like that once I convert the RAW file, I am left with a 58MB 8-bit file to send to my stock agency! This camera allows me to “grab” images I would otherwise miss as I am working with my students. 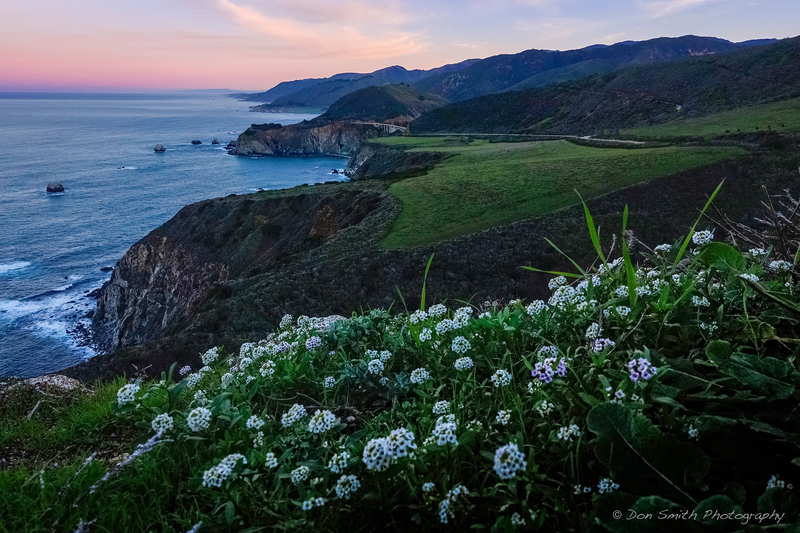 Find out more about Don Smith's workshops and reserve a spot for next year's Winter In Big Sur Workshop at donsmithphotography.com.